(1997) included several cases where outputs exceeded inputs by a large margin. These authors argue that it is unlikely that exports will be higher than inputs in annual budgets, and suggest that underestimation of inputs from groundwater and floodplains may be responsible for the imbalance. In addition, inter-annual variation in disturbances such as fire, storms, and logging that may occur infrequently are important to ecosystem dynamics, and they are unlikely to be incorporated in a 1-year "snapshot." For example, FPOM export varied fourfold over a 7-year study in a Coweeta stream (Wallace et al. 1997), and Triska et al. (1983) found a similar range over 2 years in an Oregon stream. Ideally, any ecosystem budget should be placed in a historical context in order to capture among-year variation in processing, storage, and export. The ratio of GPP to total ecosystem respiration, the P/R ratio, has long been used as a simple index of the relative importance of energy fixed by primary producers within the stream versus allochthonous organic matter derived from terrestrial plant production. Stream ecosystems at the two extremes are commonly referred to as autotrophic, meaning that energy is supplied through instream photosynthesis versus hetero-trophic, where metabolism is based on the utilization of imported dead organic matter and microbial production. According to some interpretations, the ecosystem is supported primarily by autochthonous production when P/R > 1. When P/R < 1, respiration exceeds production and the stream ecosystem depends on organic matter synthesized outside the stream (Fisher and Likens 1973). The relative importance of autochthonous versus allochthonous basal resources in supporting total ecosystem respiration is a key issue in stream metabolism. There is ample evidence that this balance changes with stream size and shade, and a general expectation of a metabolic transition from heterotrophy to a greater role of autotrophy as one proceeds downstream (Figure 1.7). Although the general concept has validity, interpretation of P/R ratios is more complicated, and P/R = 1 is probably not an appropriate transition value (Rosenfeld and Mackay 1987, Meyer 1989). The problem with using P/R = 1 as the metabolic transition value can be illustrated with a simple example of a fully autochthonous system in which the only energy supply is instream primary production, and all production is consumed and thus respired. Such a system will have its P/R = 1 and be completely dependent upon autochthonous production. As Minshall (1978) points out, if a small amount of allochtho-nous matter enters this system, its P/R will decline, even though ecosystem respiration is almost entirely due to autochthonous production. The central issue is whether stream metabolism, as measured by ecosystem respiration, depends mainly on energy produced within the stream, or on energy imported from outside. For reasons explained below, a P/R < 0.5 indicates a community strongly dependent upon allochtho-nous C (Meyer 1989). A P/R > 1 signals an autotrophic ecosystem, and its excess production must be exported downstream or stored in the stream channel. The value of the transitional P/R falls somewhere between. To better understand the difficulties of interpreting P/R ratios, recall that R is total ecosystem respiration, which is the sum of respiration by autotrophs (RA) and by heterotrophs (RH). RA is often assumed to be 40-50% of GPP (Likens 1975), and the relation NPP = 0.556 x GPP is frequently used to convert GPP into NPP (e.g., Webster et al. 1995). However, because algae have so little supporting tissue, their respiration may be closer to 25% of GPP (Geider and Osborne 1989), and so NPP would be a larger fraction of GPP. RH can be further broken down into respiration supported by autotrophic production and respiration supported by allochtho-nous sources. Whichever is the larger fraction of RH is the true measure of autotrophy versus heterotrophy. Unfortunately, we cannot separately measure these components of ecosystem respiration, which are combined in the widely used diel oxygen curve method. As a further caveat, it is not possible to determine what fraction of ecosystem respiration is supported by autochthonous versus allochtho-nous sources, nor how much is due to C respired by microorganisms versus energy flow through invertebrates and fishes. Thus, microorganisms may derive their energy from both autochthonous and allochthonous sources, and metazoans primarily from autochthonous sources (Thorp and DeLong 1994, 2002). This sort of reasoning may help to explain a striking discrepancy between Bayley's (1989) analysis of C flux in the Rio Solimoes, which showed most C originating as detritus from aquatic and floodplain macro-phytes, and other investigations directed at the food chain itself. Analysis of the stable isotope of C (13C) in fish tissue and in various plants demonstrates that the food chain supporting an abundant group of detritivorous fishes, the Char-aciformes, begins with phytoplankton and not macrophyte detritus as might be expected (Ara-ujo-Lima et al. 1986). In the Orinoco floodplain, phytoplankton and attached microalgae again are the main source of C for fishes and aquatic invertebrates, despite the greater abundance of macrophytes and terrestrial litter (Hamilton et al. 1992, Lewis et al. 2001). Although the P/R ratio should be interpreted with caution, particularly with respect to the value that signals a metabolic transition between autotrophy and heterotrophy, it remains a useful comparative measure. 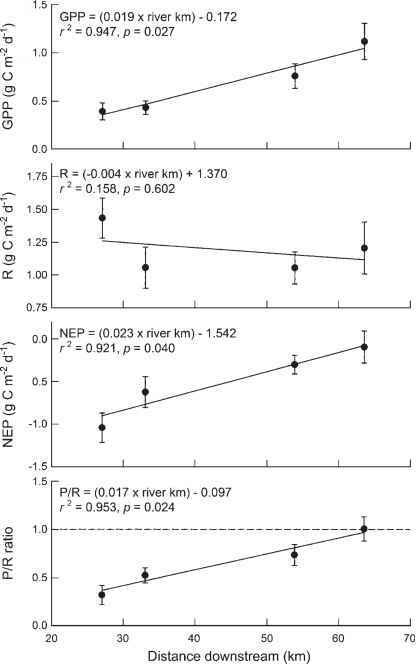 In their longitudinal study of the Little Tennessee River in North Carolina from a headwater site in Coweeta up to a sixth-order reach, McTammany et al (2003) document the downstream increase in P/R and NEP based on single-station, diel oxygen curves (Figure 12.12). By estimating the C budget at all four sites and correcting for RA, the authors concluded that the stream's metabolic transition occurred at a P/R = 0.78, and at a location 52 km below its source. 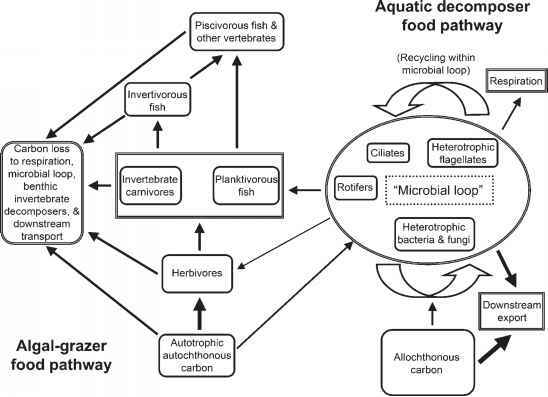 Note that this transition point is for ecosystem metabolism; for secondary production of macroconsumers supported primarily by autotrophic production, the transition may occur at a more upstream location. A downstream increase in P relative to R is a common finding of streams with forested headwaters (Naiman 1982, McTammany et al. 2003). This is apparent, albeit with local variation, from daily GPP, R, and NEP determined in four rivers located in different biomes (Figure 12.13). Each stream system was located in a relatively undisturbed catchment, had as its uppermost station a forested headwater site, and took for its lowermost station the largest stream site that was relatively undisturbed (up to seventh-order). Oregon sites receive abundant precipitation, mostly as winter rain, and support dense conifer forests. Idaho sites lie in a cold arid region of the northern Rocky Mountains, where forest cover is less than other biomes and runoff is dominated by melt of the winter snowpack. Coniferous forest and scattered deciduous tree species are found at upper elevations, and sagebrush and grass vegetation at lower elevations. Michigan and Pennsylvania sites are in the eastern deciduous biome, with less-pronounced seasonality in precipitation and runoff than either of the western sites (Minshall et al. 1983). NEP was negative in upstream reaches at all sites, and the relative importance of autotrophy increased downstream and varied with biome vegetation. In landscape settings where the headwaters are not forested, including those originating in alpine meadows (Minshall 1978) as well as prairie and pasture streams (Wiley et al. 1990, Young and Huryn 1996), no longitudinal pattern may be apparent owing to high primary production in headwaters.